My straight girlfriends always tell me how lucky I am to have another mom on my team. They tell me about all the things they could get done or how much smoother their homes would run if they had a wife. Well, I’m here to tell you what it’s really like. Sunshine and roses? Oooooh no, not always. That’s when the situation gets even more uncomfortable because now everyone in the place thinks you are STEALING A CHILD. Then there was the time when mama was home with our 2 little girls. They were going to have a fun morning together and visit me at work for lunch. I called to check in and she’s just unloading them from the car to drop it for an oil change while they play at Chuckie Cheese. Fantastic! And that’s how the world’s tackiest shoes made their way into my daughter’s closet. Sound familiar? Hmmm, I thought so. Last, but certainly not least, was the time when I brought our youngest to get ice cream. She wasn’t quite two and had just learned the word ‘daddy.’ She was obsessed with it and not having a particular person to attach the title to, in her mind, all men were now called ‘daddies’. She points out the daddies at the library, the grocery store, and everywhere else we go. No biggie, she’s still in the toddler-talk stage that no one else can understand. So about the trip to get ice cream. The nice ice cream man makes up a baby-sized soft serve cone and hands it over. My daughter gladly accepts with eager eyes. I remind her to please say ‘thank you’. And that’s when the sunshine and roses gets real. Real awkward. The Next Chapter? I Think We’re Ready. I was putting together photo books for family holiday gifts and was suddenly hit with a pang as I realized this would be the first Christmas in a while that we wouldn’t have a baby in the house. So now I just have to collect stool samples from the dogs (don’t ask), and I *think* we might just be ready to throw our hat back in the ring. How many times have you heard me say that before? With Thanksgiving coming up in 1 short week, it is official: the holidays are upon us. And with that, mothers everywhere are looking forward to peaceful, relaxing, days filled with nothing but pleasantries, delicious food, and good holiday cheer. More like wrestling overtired and highly sugared children out of their stained t-shirts and into something moderately presentable before schlepping them off to a relative’s house where you will spend the meal refilling milk cups, cutting up food that goes uneaten, and praying they don’t break Great-Aunt Sally’s lovely china. Or is that just me? I know we strive to create beautiful holiday memories for our children, but do you really have to follow through on every single Thanksgiving craft you’ve pinned? Probably not. Simplicity allows for the space in which we can breathe, relax, and truly enjoy. 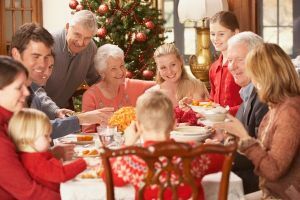 Try to find a way to simplify your holiday season this year – whether it be cutting back on the number of houses you stop at, the menu and over-the-top decorations, or the number of gifts exchanged. I assure you, your children will not miss out on anything if they have a mom who is unstressed and able to be there with them in the moment. You know your children best and the areas in which they are most able to be flexible, but maybe skipping nap for one day or staying up a little past their bedtime is okay (though I don’t recommend both!). One day of poor nutrition isn’t going to kill them and even though you may not typically allow them to watch TV, if a little football with their uncle will keep them out of trouble for 20 minutes, perhaps you’ll consider looking the other way. 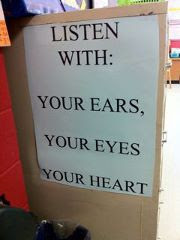 When you take the day in stride, your children will take an important cue from you. However, just like my Weight Watchers leader always said, the holiday is just one day. Once that day is over, it’ s right back on track! Because how we are feeling dictates so much of how our children are feeling, it’s important that we do what we can to lower our stress and keep our sanity during this crazy time. Allow yourself 20 minutes to take a walk or read a book, breathe deeply, and interrupt the running to-do list in your head once in a while for thoughts of peace, thankfulness, and what the holiday really means to you. Also, don’t be afraid to ask for some help. A babysitter for a couple of hours to clean your house in peace or asking your cousin to keep an eye on the baby for a bit so you can really savor a piece of Nana’s famous apple pie can go a long way. Don’t forget, this is your holiday too! How do you survive the holidays with your little ones? Any tips or tricks to pass along? I’ve been told that I’m a strict mama and I can’t say I disagree. My kids are awesome; therefore, I hold them to the high standards they deserve. I rarely give into a temper tantrum…I’m far too red-headed for that. But the trick I learned early on, and need to remind myself of often, is that strict doesn’t have to mean hard or unkind. Firm discipline can be well-served with a soft voice, a loving touch, and a bit of empathy. Recently my just-turned 3-year-old and I were off to pick up her brother at school. She asked to bring a snack to go. Sure, no problem. Well, no problem until I only filled her baggie half full with goldfish. That was a big problem worthy of epic whining. Have I mentioned 3 is not my favorite age? And, that just sent her right on over the edge. Step 2: Begin my lecture about it being close to dinner time, that goldfish really aren’t that good for you anyway and certainly aren’t worth tears this big, and that “you get what you get and you don’t get upset”. Except, I was exhausted. My youngest is back to her non-sleeping ways and I didn’t have it in me to lecture. Not that she would have heard it anyway with the screaming and stomping and all. Thank goodness I didn’t just give in and fill that bag with goldfish. Thank goodness I was in a place to deliver the consequences with a softness that allowed a special moment to happen. Time will tell if my daughter learned not to throw fits over goldfish, but she definitely learned something that day. Well, October certainly went out with a bang and here we are at the brink of the whirlwind that is November and December. 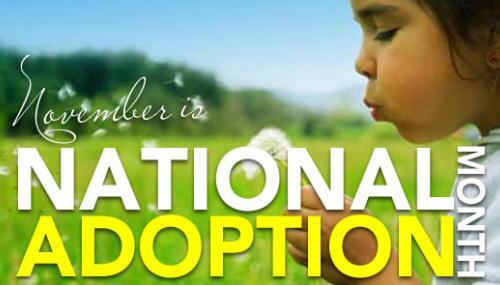 Known for crisp mornings, cozy sweaters, family time, and the celebration of thankfulness, November is the perfect choice for National Adoption Month. Right, because we don’t make brown babies here in the US. Yes, she sure does. At 3 months old. Because she’s a prodigy. See above for appropriate phrasing. Referring to children or parents as ‘real’ is hurtful since it implies there are children or parents in this world who are not real. Of course, that’s not the case. The word you are looking for is ‘biological’. “Do you have any biological children?” = fine. When referring to the mother, ‘biological’, ‘birth’, and ‘first’ are all commonly used and generally accepted terms. This question is actually not offensive at all, it’s perfectly reasonable, but I get it a lot so I wanted to include it. Simple and honest is always the best way to go. Todd Parr’s ‘We Belong Together’ is a great children’s book on the topic. *It’s important that we move away from using the old phrasing of “giving up her baby” and towards, “choosing adoption” – because, in most cases, that is exactly what these mothers are doing. They are making an incredibly difficult choice with the best interest of their child at the forefront. And I don’t know how some people come to be so incompassionate. Oh, where to begin. We’ve already covered the “giving up” part, but as for the choice itself, I can only imagine that it comes from a place of extreme selflessness and the deepest kind of love. One of the hardest parenting decisions ever to be made. Wait, did you just say that my children shouldn’t have been born? I know that’s not what you meant to say, but you kinda did. Every child born is a miracle who is meant to be here. 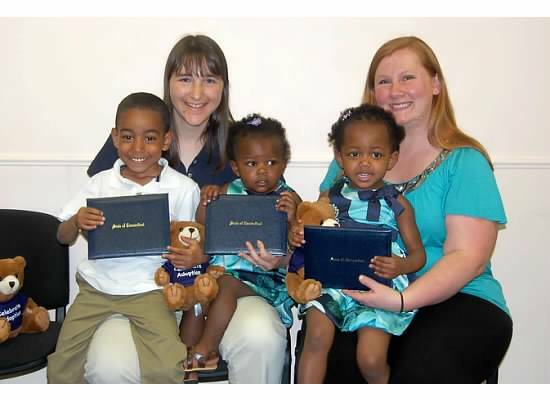 Though our story is not one in which a woman chose us to adopt her children, and it was via foster care, social workers, and judge’s orders, my heart still bursts with thankfulness for my children’s first mother. No matter what else she has or hasn’t done in her life, she created the children that I love so much and have changed my life in the most amazing way. That’s my baby mama, these are our children, and if it weren’t for her, I wouldn’t be who I am today. You better believe that these children are meant to be here. Let’s put away the judgment and negativity, and celebrate adoption for the miracle it is.